Coming up soon is the NFL’s biggest weekend; Super Bowl LIII is scheduled for Sunday 3rd February, and promises to be another great game. Hosted in Atlanta’s very own Mercedes-Benz stadium, there’s every reason for residents of the Atlanta Gas & Light service area to celebrate, even if the Falcons haven’t made it all the way this year. 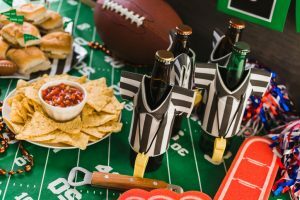 So call up some friends and get ready to celebrate Super Bowl 53 in style! Here’s our top tips. Make Great Food Your Goal! Rule Number 1 for throwing a good party; keep your guests well-fed. Don’t just rely on a few bags of chips and some soda; go the extra mile to provide a hot meal that keeps everyone’s bellies full. Especially with temperatures typically sitting around the mid-40s some hot, filling food will be much appreciated. Bear in mind that the oven is typically the least-efficient appliance in your kitchen, and consumes a lot of energy. Try to use energy-saving appliances such as microwaves and slow cookers instead, to minimize energy usage. Make your guests comfortable by keeping your home nice and toasty. However, this can be quite costly – Americans spend hundreds of dollars every winter keeping their homes at a reasonable temperature. Natural gas is the most cost-efficient way of heating your home, but this all depends on not over-paying for your fuel. A smart idea is to quickly switch your natural gas provider before Super Bowl 53 comes around. Find a cheap natural gas rate that cuts down on the costs of heating. This promises to cut down not only on the costs of the party itself, but also save you many dollars in the long run. What are you going to do once the game’s finished? Whether it’s a one-sided blowout or a nail-biter finish, like the Patriot’s heartbreaking comeback against the Falcons in Super Bowl 51, you and your guests won’t want to just drift away when it’s over. Have a plan for what to do next; will you watch a film, or get out a board game? As long as people are comfortable and well-fed you won’t find yourself splashing out a lot of cash on pizza deliveries or expensive entertainment. Okay, so perhaps this isn’t exactly going to cut down on the costs of throwing a Super Bowl party. But it’s a good excuse to purchase a smart home hub, or invest in a smart Nest thermostat. These systems are more than novelties; they can save you money over time by automatically adjusting your house to suit your needs. You can even find natural gas plans with a free Nest thermostat included in the price; that’s a huge incentive to switch today. Whoever you support at Super Bowl LIII, February 3rd is going to be a special day. Enjoy the day to its fullest by getting peace of mind – guarantee that you’re getting the best deal on natural gas in Georgia and you won’t spend any time worrying about the bill.